Although this year’s appeal will not be launched officially until the end of October, our amazing supporters have already been very busy preparing for what we hope will be another very successful Operation Santa 2018. Yes you did read that correctly! Last year Lee Southerton from Volks Magic and his lovely team of ‘Santa’s a Gangster’ supporters joined Operation Santa and made a huge impact. After dropping off toys and raising cash donations for last year’s appeal, this year they have taken their support to a whole new level! Dale Roberts who is Lee’s nephew, has donated a VW Mark 1 Golf Cabriolet and Lee has organised a prize draw, where people can contribute to this year’s appeal by purchasing as many prize draw entries as they wish at just £5 a time. All donations will go to this year’s appeal and the grand draw will take place on 14th December 2018. 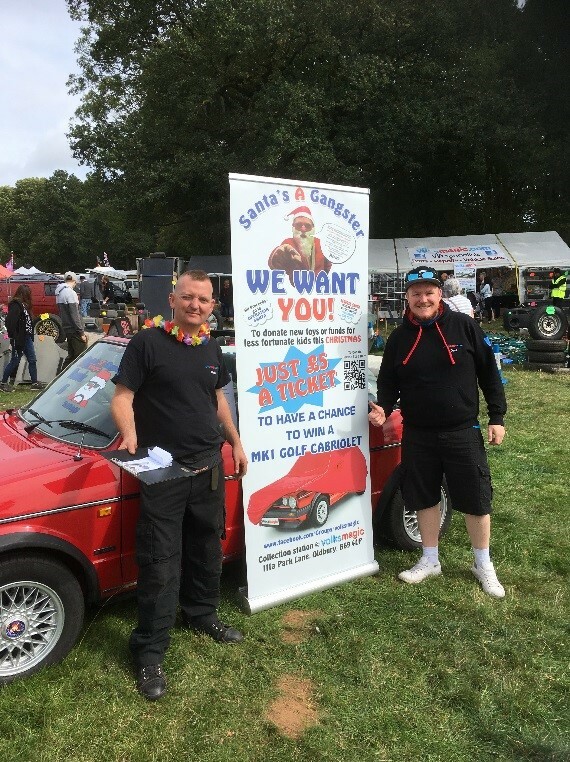 Lee and Dale were fundraising on 14th-16th September at V-Dubs in the Valley in Bewdley and raised an incredible £2700 with an auction and prize draw ticket sales. 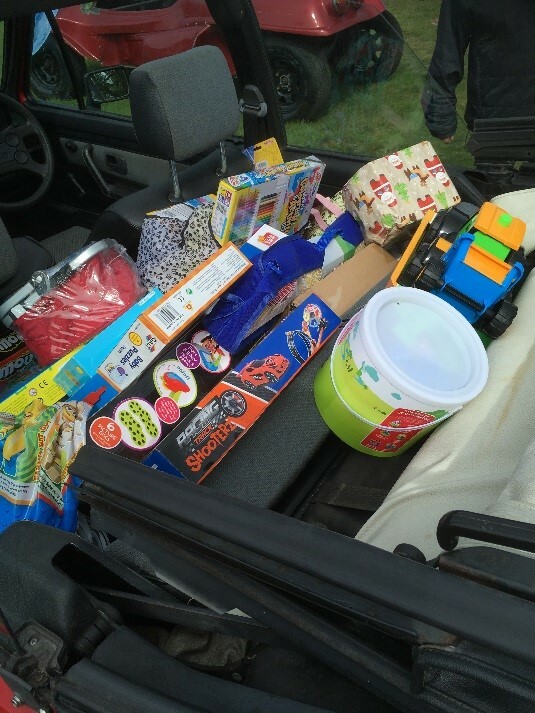 The team also organised a reverse Santa with visitors dropping off toys in the car for this year’s appeal. Wow that’s incredible and will be a huge boost to this year’s appeal! 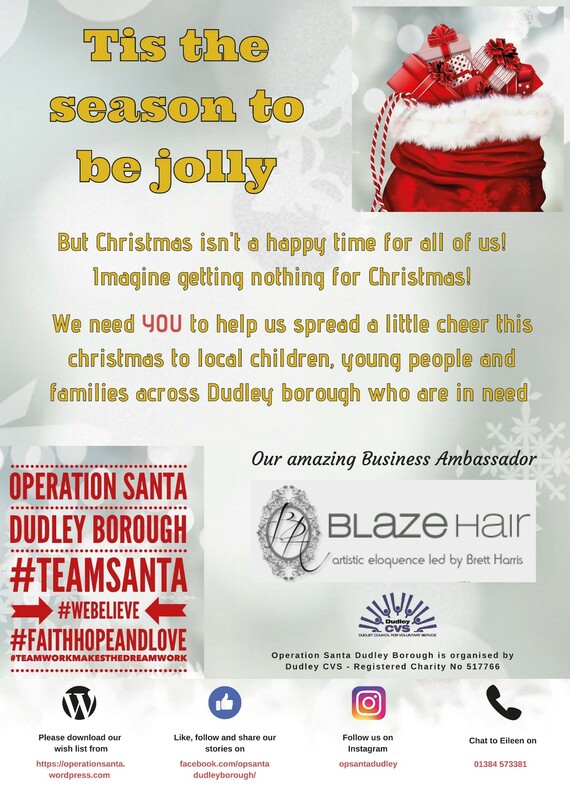 Jayne Bond and Matt Cook from Brierley Hill Civic are doing a parachute jump to raise funds for this year’s Operation Santa too. They’ve already raised almost £300 and we will be sharing pictures from the jump when they do it. This is a really lovely gesture and very brave of Jayne and Matt! I’m delighted to announce this year we have three new volunteer ‘elves’ joining the existing team, plus a fourth one who is yet to confirm. Jayne and Sarah are going to be helping with the grotto and events, and Phil is our new volunteer sleigh driver, helping with collecting donations. Welcome to the team J The lovely Rose and Andy will be helping us once again, alongside Abi, Mike, Stacey, Simon and Carl. By popular demand we have got a dedicated Operation Santa poster this year. We are hoping they will help us spread the word about what we do and whether it’s someone who wants to donate, or an organisation who supports children, young people and their families, they will be able to get in touch. If you can help us by putting up a poster or sharing via your social media feed we would be very grateful. We also have wishlists with suggested items to donate too, so why not see if your family, friends or colleagues could help this year by collecting donations? We do love a good panto and this year will be no exception. 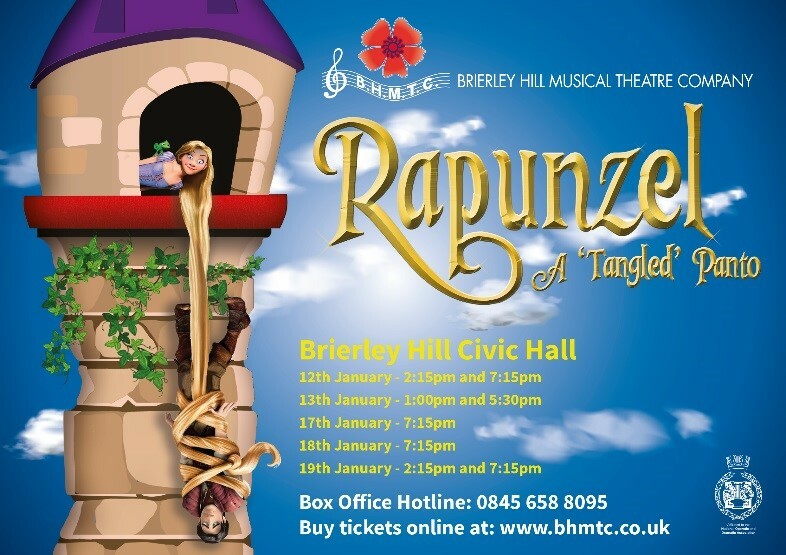 Thanks to our lovely friends at Brierley Hill Musical Theatre Company, who do us a special price on tickets, some lucky local children will be enjoying a visit to Brierley Hill Civic Hall to see Rapunzel in January 2019. After the runway success [hope you like the pun!] of last year’s fabulous fundraising fashion show in May 2018, I’ve taken the plunge and booked another date in the Civic’s diary for 2019. We raised just short of £1000 in ticket sales, tombola, auction and sales on the night, which is a huge amount of money for the appeal. So far I’ve booked Eloise Amelia and Bradley Stokes to provide some musical entertainment on the evening, and will finalise what sort of event it will be next year. The fashion show was a great success, but it depends if we have any clothes donated for this year’s Operation Santa. So watch this space and I will keep you posted. Keep yourself updated on what we’re doing this year!